Speed really matter in football now days. Football player with accurate speed and acceleration create trouble for the opponents. For previous couple of years its Ronaldo, Messi, Eto and Robben who made history due to their on field speed. Gareth Bale is now well known for his speed and dribbling skills. He is currently fastest footballer in the world according to sources, his acceleration speed is (36.9 km/h). Arjen Robben is fastest runner in the team of Bayern Munich. 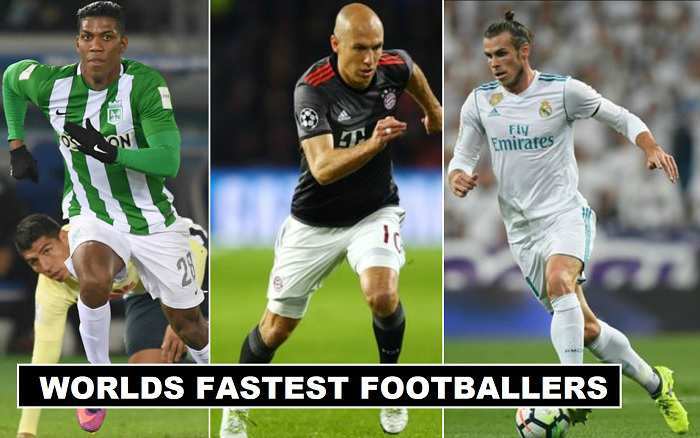 Robben set fastest speed record with (37 km/h) he may not score many goals but assisted most of the times due to his fastest run and dribbling style. He made this record of top sprint in world cup 2014 against Spain and score the goal. Gareth Bale sets the record of fastest speed in La Liga. Bale massive speed during the matches bring him bit stronger challenger for the opposition. He score great goals with top speed and dribbling efforts. Orlando Berrio one of the best wingers in the team of the Colombia. He scored 2 goals for the team of (Flamengo) in 18 matches. Berrio gets spotlight due to his fastest run on-field.